Bird's Eye View Large blooms of the algae Cochlodinium polykrikoides in Chesapeake Bay with Glouceser Point and the mouth of the York River in the background. Photo by Kim Reece/VIMS. Sarah's Creek Aerial photograph of the algal bloom near the mouth of Sarah's Creek near the mouth of the York River in lower Chesapeake Bay. Photo by Kim Reece/Bill Jones. Boat Streaks A powerboat moves through the algal bloom near the mouth of Mobjack Bay, with the track of an earlier boat wake visible lower in the image. Photo by Kim Reece/Bill Jones. Bloom Tendrils Large blooms of the algae Cochlodinium polykrikoides in Chesapeake Bay near New Point Comfort at the mouth of Mobjack Bay. Photo by Kim Reece/VIMS. Bloom Tendrils Large blooms of the algae Cochlodinium polykrikoides in Chesapeake Bay looking west toward Milford Haven. Photo by Kim Reece/VIMS. Bloom Front In some places the bloom has a sharp edge, marking a front between water masses with different properties. Photo by Kim Reece/VIMS. Researchers at the Virginia Institute of Marine Science continue to monitor the algal blooms that have been discoloring local waters during the last few weeks. These “red tides” occur in Chesapeake Bay every summer, but have appeared earlier and across a wider area than in years past, likely due to last winter’s warmth and this summer’s heat. Red tides are caused by dense blooms of tiny marine plants called algae that contain reddish pigment. Algae are normal components of all aquatic environments, but can produce what is known as a “harmful algal bloom” or “HAB” when they bloom in significant numbers and generate toxic byproducts. HABs can be harmful to both marine organisms and human health. Professor Kim Reece, a member of Virginia’s Harmful Algal Bloom Task Force, is the focal point for HAB research and monitoring at VIMS. Reece, fellow VIMS professor Wolfgang Vogelbein, and other colleagues at VIMS partner with representatives from the Virginia Department of Health, the Marine Resources Commission, the Department of Environmental Quality, and Old Dominion University to track the appearance of algal blooms within Virginia waters and to determine whether the bloom organisms pose any threat to marine life or human health. There is currently no evidence of harm from the recent blooms, which were first observed in early to mid-July, 2 to 3 weeks earlier than in recent years. 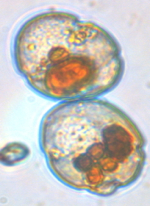 Study of samples taken in the York River near VIMS’ Gloucester Point campus show that they comprise dense aggregations of Cochlodinium polykrikoides, a single-celled marine dinoflagellate. Reece says “Blooms of this and closely related species may harm oyster larvae and other marine life, and are associated with fish kills and economic loss in Japan and Korea, but we’ve had no reports of any of these effects in local waters this year.” Fish and crab kills reported in the Bay during Cochlodinium blooms in previous years are likely due to low levels of dissolved oxygen, which are associated with blooms of many different species and occur when the algal cells die, sink, and decay. Real-time monitoring of algal blooms is not an easy task, as it involves developing and applying DNA tests to rapidly identify—from among a huge variety of mostly benign microorganisms—the particular algal species that have been observed to produce toxins. Development of these molecular DNA assays is a prime focus of Reece’s research at VIMS. Monitoring also requires daily collection of water samples from all across lower Chesapeake Bay. 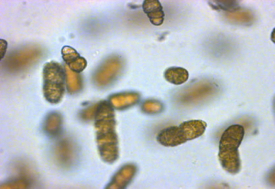 Analysis of these samples at VIMS shows that Cochlodinium is currently blooming in the York, James, Elizabeth, and Lafayette rivers; Mobjack Bay; and near the mouth of the Bay in the vicinity of the Hampton Roads Bridge Tunnel.